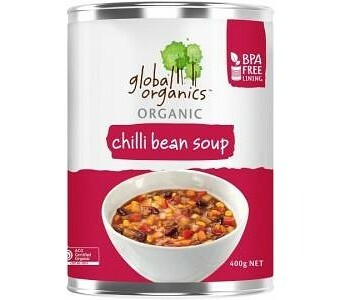 Global Organics Organic Chilli Bean Soup is packed with organically grown vegetables, in a BPA-Free can and free from artificial flavouring. Enjoy it on its own or for an extra wholesome and hearty meal, accompanied by your favourite bread. Ingredients: Water, Kidney Beans* (18%), Tomato Puree*, Potatoes* (9%), Red Bell Peppers*, Maize*, Onions*, Carrots*, Wheat Protein (wheat gluten*, whole wheat flour*, wheat bran*, sea salt), Vegetable Stock* (sea salt, onions*, carrots*, leeks*, parsnip*, parsley*, turmeric*, garlic*, nutmeg*, lovage*, pepper*), Sea Salt, Raw Cane Sugar*, Spices*, Locust Bean Gum* (410), Chilli (0.2%)*. *Organic ingredients. Contains gluten.